use these link to check the images. 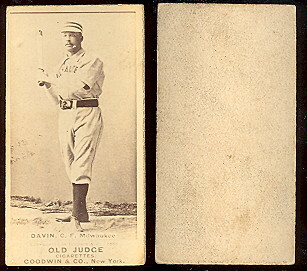 19TH CENTURY BASEBALL CARDS: THE OLD JUDGE SECTION! This is the recently renovated Old Judge section. We have decided to make these cards available to the public. As many of you know, I have had some Old Judge cards up for display only. You now have a place where you can go and shop for some of the rarest, and most sought after baseball cards ever made! There are close to 300 cards available here, and you will be hard pressed to find another location where you have this kind of selection! This is one of the most fascinating of all card sets, as the number of cards issued will probably never be finally determined. These cards were issued by the Goodwin & Co. tobacco firm in their Old Judge and to a lesser extent Gypsy Queen cigarettes. 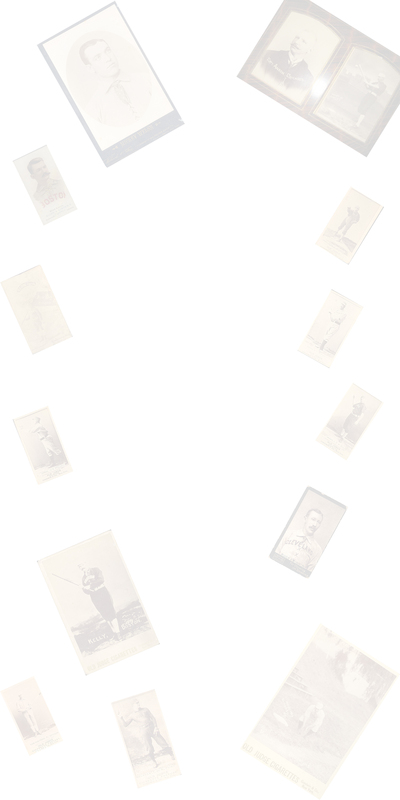 Players from more than 40 major and minor league teams are pictured on these approximately 1-7/16" X 2-1/2" cards, (as you see in the scans, they vary quite a bit in size) with some 518 different players known to exist. Up to 17 different pose and team variations exist for some players, and the cards were issued both with and without dates on the card fronts, numbered and unnumbered, and with both handwritten and machine printed names. Known variations number in the thousands. The cards themselves are sepia-toned photgraphs pasted onto thick cardboard. They are blank-backed. The N172 listings are based on the recordings in The Cartophilic Society's (of Great Britain) World Index, Part IV, complied by E.C. Wharton-Tigar. Some of the cards in this section are graded, and you will see a (sgc **) whatever the grade is on the image. You will see pictures of all of the cards available, in most cases in alphabetical runs, with Names, and catalogue numbers. This would be the designated catalogue number for this card. There are close to 300 cards available currently, so there are many pages of images with card information, with links to all of the pages, and the price list. Prices and availability will be seen on the complete list of these, as each card variation is listed with price and condition information. These cards are not easy to find, and in most cases, posted prices will stand. We may be willing to make trades. We are always interested in buying more collections, large or small. Price and availability are subject to change, however, the complete listing of these cards is very up to date. OJ # 41 WELS-Z Indianapolis Find Snyder Collection N321 S.F.Hess & Co.
TOBACCO PAGE COUPON TOBACCO SILKS & BLANKETS TY COBB PAGE T3 TURKEY RED!! T200 FATIMA TEAMS!! Check the prices, availability and order here! Cards are subject to prior sale, prices are subject to change. Some of the images may say "tough card" on the image. These are cards that to our knowledge, are either more rare poses, teams, or in some cases, just not that many of them made. They are priced accordingly. Please use the price list database to confirm prices and availability. HALL OF FAME AND PORTRAIT CARDS! 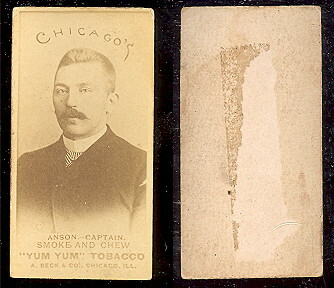 Rare mini, dotted tie, NL player, and . .                     Burns sold              Silch Sold.